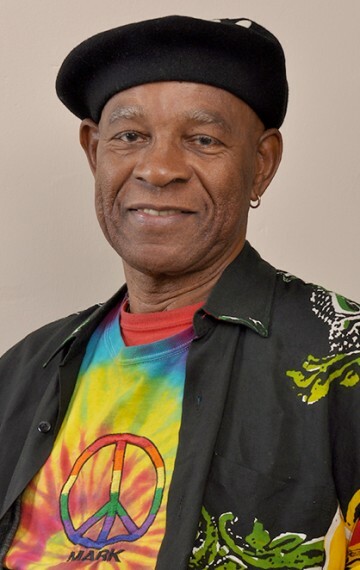 Renowned artist and storyteller, Dr. Lorenzo Pace created a series of poignant picture books – the African American Quartet – that pay homage to black history and the power of the human spirit. 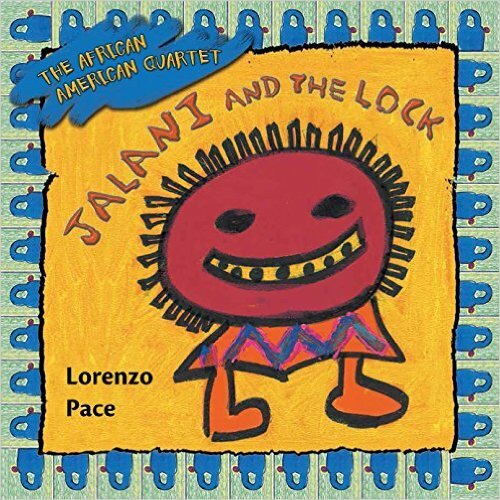 Pace’s debut, Jalani and the Lock (Rosen), was inspired by the lock that bound his enslaved great-great grandfather and was handed down to him. The three others – Marching With Martin, Harriet Tubman and My Grandmother’s Quilts and Frederick Douglass and the North Star – explore the lives of these pivotal historic figures. 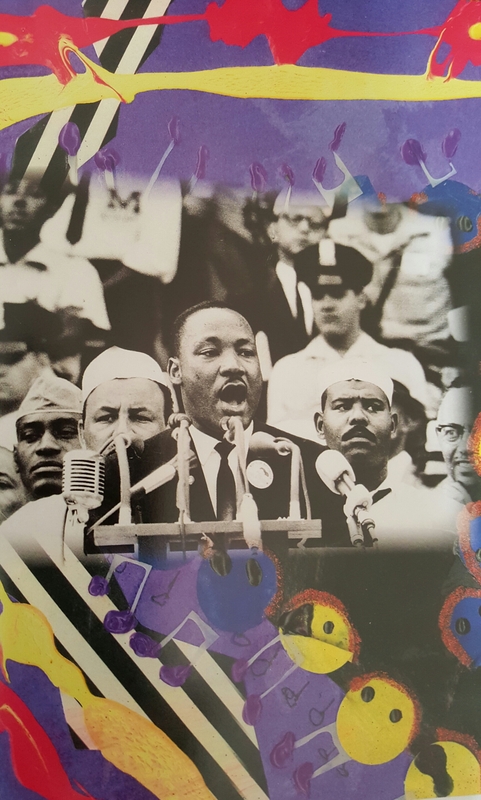 Dr. Pace, whose monument Triumph of the Human Spirit in New York City’s Foley Square honors the enslaved Africans originally buried there, uses words and mixed media artwork in his children’s books to bring to life stories from the past. We are proud to celebrate Dr. Lorenzo Pace on Day 14. It began with a lock. A cold, hard, more than 150-year-old iron lock. A legacy of man’s inhumanity to man. When my father passed away in Birmingham, Alabama in 1991, I left New York and went South to bury him. My Uncle Julius shocked me and the rest of my family by giving me a lock that had shackled my great-great grandfather Steve Pace in chains. Steve Pace had passed down the lock to other Pace men. I accepted the lock but really didn’t want it. I didn’t know what to do with it, so I put it in my closet in Brooklyn. Not long after that, my daughter, who was about 8, came home and said, “Daddy, kids are making fun of me because of my hair, my nose, and my lips.” I asked why. She said they told her it was because she was from slaves. I said, “Wow, baby. You don’t have to be ashamed of your looks.” I told her she came from beautiful people, strong, creative, and resourceful people. Our conversation inspired me to explore the lock. The lock was calling out, “Hey, come deal with me.” So I explored the lock and my great-great-grandfather’s story. Turns out, after emancipation, Steve Pace purchased more than 500 acres of land and shared it with his family. His third eldest son was in the first class at the Tuskegee Institute. He was a minster and the church he founded still exists and will soon be on the National Register of Historic Places. Soon, I found myself writing Jalani and the Lock, to explain to my daughter and other children our history and the triumphs that are the essence of it. I finished writing and illustrating and shopped for a publisher for five long years. One day a buddy in Chicago referred me to Rosen Publishing. I met with the publisher. He loved the content. He loved the illustrations. He agreed to publish it. It came out in 2000. I’ve traveled the world with Jalani and the Lock and the book has been translated into Spanish, French, and Dutch. Last year, Jalani and the Lock was re-printed as part of a series I wrote and illustrated called the African American Quartet. 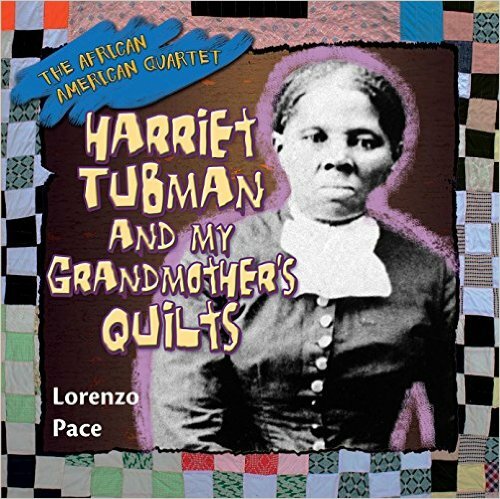 The Quartet includes: Marching with Martin, Frederick Douglass and the North Star, and Harriet Tubman and My Grandmother’s Quilts. The Quartet came about after the publisher and I began talking about ways to build on Jalani’s story and bring it into the 21st century. All of the books relate to my personal experiences. I marched with Dr. King in Chicago when I was a teenager. I grew up seeing Frederick Douglass on my grade school walls. I grew up hearing about Harriet Tubman from my grandmother. She and my mom were quilters. I learned that quilts sometimes had anti-slavery sayings woven into them, and there is a legend that the enslaved put Underground Railroad symbols and routes in their quilts. There’s also an Underground Railroad station in my Brooklyn, NY neighborhood. For all these reasons, I wove photos of my family’s quilts into the book’s illustrations. The inspiration for my books has come first from my personal history. It occurred to me that if these stories are in my family, they’re probably in most African American families. I’m inspired by John Coltrane and Charlie Parker. I listen to them as I write and create. They are such innovators, constantly bringing out new ways of thinking in their music. They make we want to go to a higher plane as an artist. Alex Haley inspires me because of his groundbreaking research on our history. He made me want to dig deeper and deeper. The artist and author Faith Ringgold also inspires me. I love Maya Angelou’s books, period. Her gift for playing with language is second-to-none. There are so many great writers, but those who tell our stories –new stories, uplifting stories –inspire me most. I’ve also gotten motivated by the books of Caroline Brewer. She’s been under the radar because of her focus on literacy, but is about to come into greater recognition. 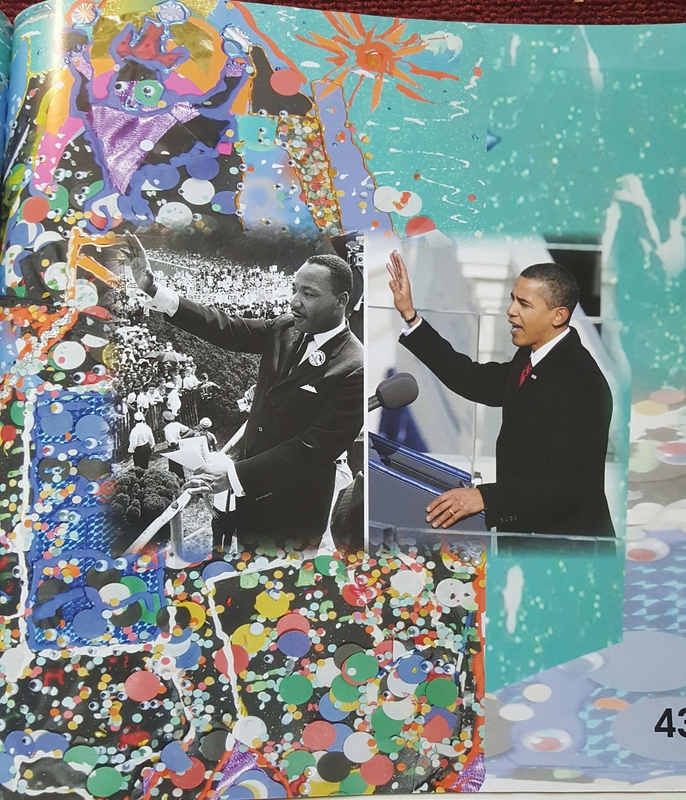 She has some very intense and motivational books on the African American experience, like a fun but educational picture book on President Obama’s 2008 election, Barack Obama: A Hip Hop Tale of King’s Dream Come True. And the next book, a middle grade novel, is intense, fun, and motivational, too. complete a story and how to illustrate it. I go out and get all kinds of materials that I think can help. I go to the art store. I look for materials in the street, in my environment, and just go. I’ve illustrated my Quartet books using mixed media and collage. I will use an old dress from a thrift store with a particular pattern or color, beads, paper sacks, kente cloth, animal print, newspaper print. I also use acrylic paint, watercolors, colored pencils, markers, glitter, whatever makes a page pop. I let everything around me speak to me and then I put the pieces together. The most important thing that I do as I work is have fun. I also know I can get kids on color. They love color and so do I. I approach my art in the same way I approach living: be sure to have some fun and add lots of color. Publisher’s Weekly called the first edition of Jalani and the Lock “a stunning debut.” NBC News cited Harriet Tubman as one of the top 14 books to read in February 2015. The School Library Journal met me at my Brooklyn studio last year to do a piece on the art I created for the books. Booklist offered these words below about the new quartet. Walter Dean Myers and Chris Myers said it best in their New York Times pieces a couple of years ago. The publishing industry is not doing enough to reflect the rich and deep and vibrant diversity of this country. There are so many children who need to see themselves in books. Books are game-changers. And yet, authors of color can’t depend on the industry to do it all. The efforts of sites like thebrownbookshelf.com are critical to helping put the spotlight on authors and illustrators of color. Whatever we can do to support one another makes us more powerful. Find out more about Dr. Lorenzo Pace here. One thing I love about children’s lit is the variety of people in it; the Brown Bookshelf brings out folks I knew nothing about, and am glad to meet. Looking forward to finding these books!